HIMSS 2015 featured The Internet of Things for Health™, the Intelligent Hospital, the Intelligent Medical Home (i-Home™) as well as mobile, cloud, social, analytics, population health and value based care. 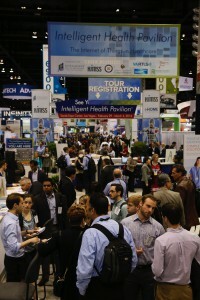 Record attendance at HIMSS 2015 in Chicago – over 43,000 people. Now that HIMSS15 is over, take a look at some of the trends that dominated the headlines, the social buzz and the chatter at after show cocktail parties. mHealth – HIMSS 2015 mobile health survey and ROI issues as well as HIPAA Privacy and Security. Emerging technologies focused on referrals, eligibility and personal health engagement / patient engagement. While there is work being done to break down the data and process silos in healthcare, much more work needs to be accomplished to realize the promise of these solutions. The health care industry continues to rely on X12 EDI claims data because it is standardized. Though clinical data is increasingly structured (‘discrete data’ per Meaningful Use of EHR regulations) it is not standardized as to specific content such as blood pressure (systole and diastole can be expressed as 120 / 80, “blood pressure in normal range” etc). Therefore, it can still be difficult at times to query and manage populations using clinical data. It’s needed though if we are going to deliver on the promise of value based care and population health. Read the full story here in GovHealthIT.